Is Rent to Buy a way for a tenant to buy their home? Is looking for a new rental property the only option a tenant has when the landlord puts the "For Sale" sign on their home? Is there a way a tenant can buy their home even though we don't qualify for a home loan at the moment because they don't have enough deposit or a steady income? The good news is that the tenant has a way - it is called Rent to Buy / Rent to Own. What Rent to Buy does is to give a tenant the time they need to build the deposit and a track record of payments to qualify for a home loan. In return, Rent to Buy helps a landlord receive the price they want, and their tenant pays extra rent until they are ready for a home loan. It is a well-known and successful vendor finance technique, which is often called a Lease Option. 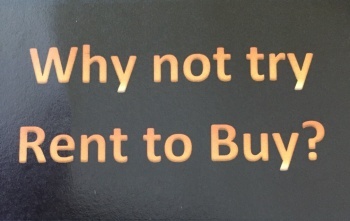 Not all tenants will qualify for Rent to Buy. Tenants with a good job or a steady business will qualify. Tenants who rely on Centrelink income, or casual income, or have a start-up business, will not qualify. Is Rent to Buy legal in Australia? Yes it is. In a recent decision, the Supreme Court of New South Wales has said that a standard residential lease coupled with an option to purchase is a perfectly legal way of documenting a Rent to Buy arrangement. To find out more about Rent to Buy, and the Supreme Court decision, click: Can an Option to Purchase be used to buy a home or a home unit? Anthony Cordato, Solicitor with Cordato Partners, says with the new credit reporting regime starting on 12 March, he anticipates more people will use these arrangements to improve their borrowing capacity. "Until now, credit records have only contained the negative things - if you've defaulted for 60 days or more, or you've had a whole lot of loan applications and things like that," he says. "So to date, if you've wanted a loan, that's all the lender could see and all they were interested in. But they will now be interested in your credit history for the past two years." 'With rent to buy, you'll build up a great payment history, which can then be taken into account by the lenders when you move to purchase the property completely." Mortgage stress affects home owners and investors. Mortgage stress is like an illness – there are remedies available to cure it. Experienced Vendor Financiers have the tools to cure mortgage stress. In this article we look at the current symptoms of mortgage stress and the many remedies to cure it. What is mortgage stress and where can it be found? Mortgage stress is a hot topic at present because a combination of recent interest rate rises and cost of living rises have cut into the weekly pay of many home owners, and have eaten into the money saved for a rainy day. the need to move away for work purposes and being unable to quickly sell the house. Money shocks might be overcome in a matter of a few months when the wage earner returns to work and is able to continue with the mortgage repayments. These minor or temporary money shocks can be dealt with by new repayment arrangements or repayment holidays. Other money shocks are more permanent, such as relationship break-ups or where income shortfalls have been funded by more borrowing and borrowing limits have been reached. These permanent money shocks can only be dealt with by sale of the mortgaged property or finding some other way of obtaining mortgage relief. The Commonwealth Government recently introduced the National Consumer Credit Code for the purposes of protecting and assisting borrowers. It has the force of law throughout Australia. The National Consumer Credit Code gives borrowers the right to change their payment arrangements if they experience hardship because of illness, unemployment or other reasonable cause. (see section 72). The National Consumer Credit Code sets out a detailed process for dealing with changes to mortgage loan arrangements, which are best summarised in the Commonwealth Government Information Statement which by law must be included in every mortgage loan. These rights and processes are carried over from the former Uniform Consumer Credit Code, which has applied to mortgage loans since 1995. What if the mortgage stress is minor or temporary? What if the mortgage stress is permanent? What can and should be done about mortgage stress - If the mortgage stress is minor or temporary? What do I do if I can not make a repayment? Get in touch with your credit provider immediately. Discuss the matter and see if you can come to some arrangement. You must discuss your problem with making the repayments on time with your lender - You cannot adopt a head in the sand attitude – you cannot just pack up, send your keys to your lender and walk away because you are still responsible to pay any shortfall between the price your lender sells the house for and the loan amount plus default interest and sale costs. to pay additional amounts to catch up on the missed payments – this applies when the money shock is temporary and income levels return to normal. to synchronise the date the lender deducts the repayment to match the date that the wage or regular income is deposited into the bank account – this will help overcome missed payments due to insufficient funds in an account at the date the bank debits the repayment. to extend the life of the loan to make it a 35 or 40 year loan instead of a 25 or 30 year loan – this will reduce the regular repayment amount. to switch the loan to interest-only for a time – this will also reduce the repayment amount compared with a principal and interest loan. To request a new payment plan, the borrower must complete a hardship application. Most lenders have special forms to be completed with information such as reasons for the application, and a financial statement. What can and should be done about mortgage stress - If the mortgage stress is permanent? Mortgage stress is permanent where it comes about because of a dramatic change in financial circumstances, or is permanent in nature. What can I do if I find that I can not afford my repayments and there is a mortgage over property? give the property to someone who may then take over the repayments, but only if your credit provider gives permission first. to find someone who is willing to make the repayments and to accept the keys to the home so they can do so, and after a time, pay out the mortgage on the property – the task of finding someone who is willing to do so is becoming easier as more and more vendor financiers become qualified to use the necessary techniques to turn this advice into reality. The words give the property to someone who may then take over the payments is a perfect description of a purchase option, which vendor financiers call an assumptive option plus lease. If you would like to know more about this alternative, or if you would like a referral to a vendor financier to act as your property doctor, please use the contact me details on this website and provide details of yourself , your situation and your home. I will find a property doctor who practises in the area in which the house is located. How do banks and lenders deal with mortgage stress? Banks and lenders are concerned to deal with mortgage stress as soon as it arises. There are two important dates for banks and lenders – the first is loans 30 days late, the second is loans 90 days late. Banks and lenders have an additional problem when a mortgage loan is 90 days late. They call these mortgage loans ‘non-performing’ or ‘impaired loans’. Their problem that they must report these loans to APRA (the Australian Prudential Regulatory Authority) and they must provision these loans against their profits. This is emphasised because the bank or lender (as credit provider) must give their permission to any arrangement the borrower puts forward to address the problem of not being able to make the repayments on time. The Commonwealth Government Information Statement advice has the status of law, as it is contained in the National Consumer Credit Code, which is part of the National Consumer Credit Protection Act, 2009. This is Commonwealth Law, which applies throughout Australia. Banks and lenders wish to avoid taking possession and selling the property themselves because they do not want to expose themselves to claims that they have sold the property at less than market value, or that they have taken too long to sell the property and its condition and state of repair has deteriorated in the meantime because it has been unoccupied. The Commonwealth Government Credit Advice to borrowers is contained in an Information Statement which must be attached to every Residential Loan Offer made by a Bank or other lender. The Information Statement is Form 5 of the National Consumer Credit Protection Regulations 2010. If you have any concerns about your contract, contact the credit provider and, if you still have concerns, your credit provider’s external dispute resolution scheme, or get legal advice. 18 What can I do if I find that I can not afford my repayments and there is a mortgage over property? · give the property to someone who may then take over the repayments, but only if your credit provider gives permission first. 22 What do I do if I can not make a repayment? · to delay payments for a set time. 23 What if my credit provider and I can not agree on a suitable arrangement? If the credit provider still refuses your request you can complain to the external dispute resolution scheme that your credit provider belongs to. Further details about this scheme are set out below in question 25. 25 Do I have any other rights and obligations? IF YOU HAVE ANY COMPLAINTS ABOUT YOUR CREDIT CONTRACT, OR WANT MORE INFORMATION, CONTACT YOUR CREDIT PROVIDER. YOU MUST ATTEMPT TO RESOLVE YOUR COMPLAINT WITH YOUR CREDIT PROVIDER BEFORE CONTACTING YOUR CREDIT PROVIDER’S EXTERNAL DISPUTE RESOLUTION SCHEME. IF YOU HAVE A COMPLAINT WHICH REMAINS UNRESOLVED AFTER SPEAKING TO YOUR CREDIT PROVIDER YOU CAN CONTACT YOUR CREDIT PROVIDER’S EXTERNAL DISPUTE RESOLUTION SCHEME OR GET LEGAL ADVICE. EXTERNAL DISPUTE RESOLUTION IS A FREE SERVICE ESTABLISHED TO PROVIDE YOU WITH AN INDEPENDENT MECHANISM TO RESOLVE SPECIFIC COMPLAINTS. YOUR CREDIT PROVIDER’S EXTERNAL DISPUTE RESOLUTION PROVIDER IS [INSERT NAME OF EXTERNAL DISPUTE RESOLUTION PROVIDER] AND CAN BE CONTACTED AT [INSERT TELEPHONE NUMBER, EMAIL/WEBSITE AND POSTAL ADDRESS]. If I wanted to find the information Statement myself, what do I do? Paragraph 16(1)(b) requires every credit provider to provide an Information Statement in the prescribed form set out in the Regulations, meaning the National Consumer Credit Protection Regulations. Regulation 70 requires every credit provider to provide an Information Statement about debtor’s statutory rights and obligations in writing in accordance with Form 5. Form 5 is a form which is found at the end of the Regulations.